BEIJING - Chinese Vice Premier Wang Yang slammed Prime Minister Shinzo Abe during a meeting with Japanese business leaders Tuesday, putting the blame squarely on the Abe government for the severe strains in bilateral ties. “The Abe regime is causing a lot of visible and invisible damage (to Japan-China ties) with the way it is acting now,” Wang said in a meeting with a Japanese business delegation led by former Foreign Minister Yohei Kono. 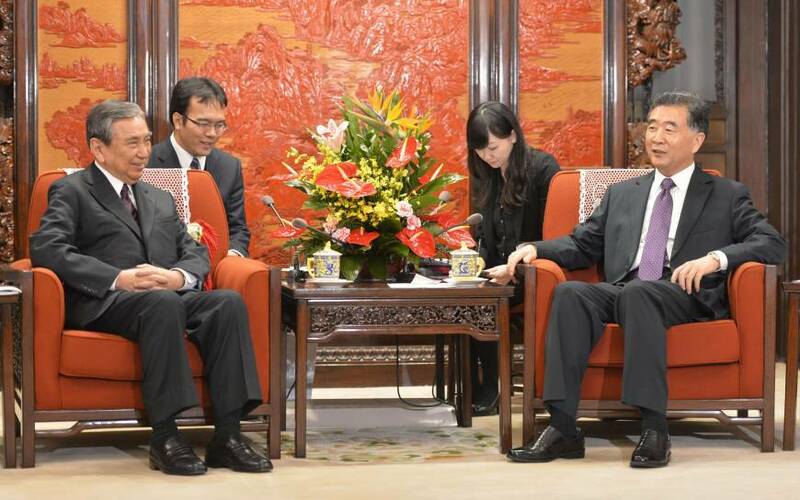 China appreciates the “relentless efforts of the heart and mind” that Kono has devoted to Sino-Japanese relations, Wang said at the outset of the meeting that was open to the press. Bilateral ties have been severely strained by a bitter dispute over islands in the East China Sea and issues of history related to the 1937-1945 war Japan waged in China. Beijing has shunned Abe, viewed in China as a nationalist, since he came to power in December 2012, and bilateral ties deteriorated further after Abe visited Tokyo’s war-linked Yasukuni Shrine in December. Kono, a former leader of the ruling Liberal Democratic Party who also served as Lower House speaker from 2003 to 2009, is visiting Beijing as head of the Association for the Promotion of International Trade. Most of the members of the delegation are Japanese business leaders, including Nobuyuki Masuda, former chairman of Mitsubishi Heavy Industries Ltd. According to sources familiar with bilateral relations, Kono had asked his Chinese hosts to arrange a meeting with Premier Li Keqiang but ended up meeting with Wang. 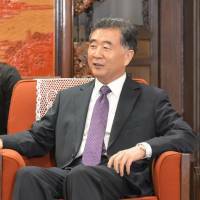 Reflecting the soured ties between Tokyo and Beijing, Wang was also the most senior Chinese official to meet with Kono during his visit to China a year ago. Wang, the vice premier responsible for commercial affairs, and Kono focused on bilateral economic cooperation during their meeting Tuesday. The Association for the Promotion of International Trade is one of seven Japanese groups dedicated to promoting closer political and economic ties between Japan and China.